Set on Skiathos island, Aegean Suites is one of the most exclusive resorts for adults and the perfect place for couples. It is in a superb location overlooking the golden sands of Megali Ammos and offers easy access to the beach. Each of the suites has stunning views of the sparkling ocean, as well as elegant interiors and modern amenities. With its terracotta interiors and beautiful cream designed architecture, Aegean Suites provides a striking contrast with the sea. Explore the charming Skiathos Island in all its beauty and take delight in its peaceful waters as you take boat trips from the hotel. If you prefer to stay at the hotel and simply relax, you can choose couples’ massage at the spa or relax in an open air Jacuzzi. The hotel has 21 stylish suites. This is an adults only property. The hotel is not suitable for guests with limited mobility. Karavia Restaurant serves delicious light lunches by the swimming pool. Dishes include traditional Greek and Mediterranean cuisine. This is a superb gourmet terrace restaurant where you can delight in the delicacies of dining while overlooking the pool and the sea. Award-winning chefs serve up fine food and wine in a beautiful candlelit atmosphere. The main lounge bar is elegant, stylish and offers the perfect setting for pre- or after dinner drinks. Enjoy cocktails and fresh juices around the swimming pool and open air Jacuzzi throughout the day. Relax on the golden sands of Megali Ammos beach while sunbathing in your own private area. 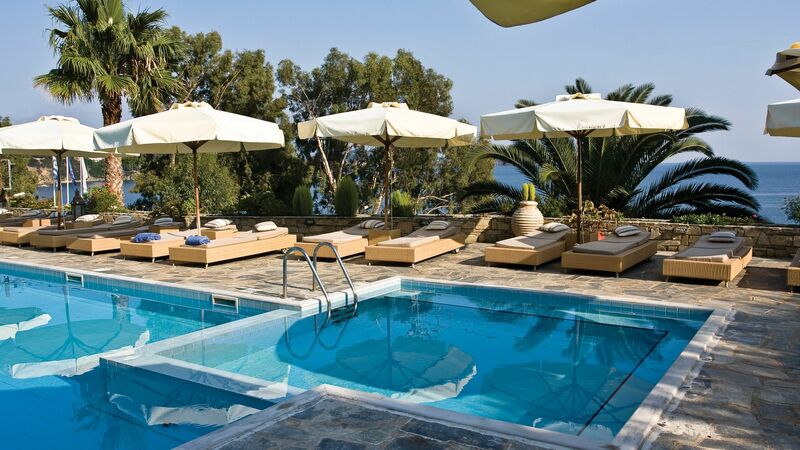 Bathe in the glorious sunshine before taking a dip in the hotel’s large swimming pool. 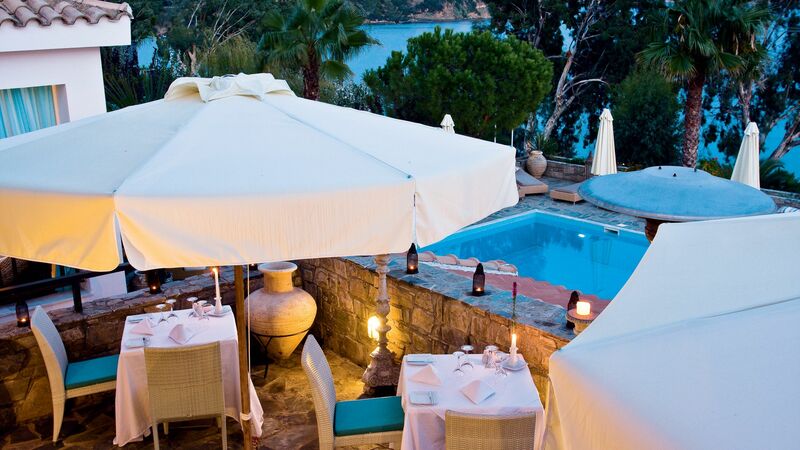 The beautiful blue waters are surrounded by a terrace with loungers and parasols. The hotel’s spa features a range of treatment options to leave you feeling refreshed and relaxed. Experience the tranquility from the moment you enter, or choose to enjoy a couples massage on the beach. State of the art machines and equipment are provided in the hotel’s fitness centre to help you maintain your fitness during your stay. Aegean Suites allows you to experience the island in an exciting way, with hire services available for helicopters, yachts, jet skis and cars. Aegean Suites is located on the south east coast of the Greek island of Skiathos, in the town of Megali Ammos. Here you’ll find a relaxed atmosphere and secluded golden sandy coves just waiting to be discovered. Skiathos Town is just a 20-minute walk along the coast and provides you with some wonderful shops, bars, and restaurants, as well as a cosmopolitan atmosphere. Spend your day on Megali Ammos’ main beach, where you can soak up the sun and stop for lunch in one of the many cafés or restaurants. The crystal clear waters make this the ideal spot for some snorkelling, while water skiing and boat trips are also available. If you want to pick up unique gifts, souvenirs, and fresh local produce head to one of the weekly markets. Aegean Suites is a 10 minute drive from Skiathos Airport. Junior Suites with Garden View feature elegant decor and a bedroom with king size bed and a separate living area. The suite also benefits from a garden terrace for guests to enjoy. Standard Suites Garden View comprise of separate bedroom and living areas and private garden terrace. These well-appointed rooms with elegant interior and cosy chairs and sofas feature air conditioning, minibar, complimentary wifi, direct dial phone, satellite TV, CD player, hairdryer, Sampar natural products, bathrobes and slippers. Pampering extras include fruits and wine on arrival and an evening turn-down service. Deluxe Suites Sea View enjoy stunning sea views from a private balcony. All facilities are as per Standard Suites. Charming Suite Garden View are open-plan suites with separate sitting area and bathroom is especially designed for romantic and private moments and enjoys a private patio with an open-air Jacuzzi®. Heaven Suite Sea View, with a separate living and bedroom area, measures 55m² and features a large private teak wood terrace with a Jacuzzi® and stunning sea views. Two Bedroom Suite Sea View enjoys stunning sea views from a private balcony. The suite comprises of a living area, master bedroom with king-size bed, second twin bedroom with a private entrance, and two bathrooms. Save up to 20% on the hotel price for holidays between 03 May - 29 June 2019 & 08 September - 03 October 2019 or up to 10% between 30 June - 07 September 2019 booked by 28 February 2019 (minimum stay of 5 nights required). We visited this place for a drink as we had previously stayed here earlier in the year. As expected, the staff were welcoming. It is only a short walk along the beach from the town centre so is well worth a visit. Apologies for the late review. We stayed at this beautiful hotel in June 2018. What a haven! 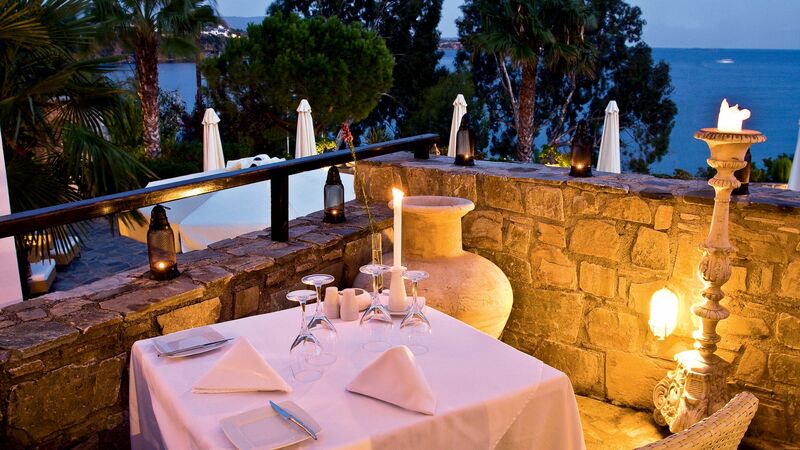 Beautiful setting, great food and the comfiest sunbeds ever! The staff are amazing,with special thanks to Kristina,Simos and Vlad... I will never have a nicer margarita by the pool. We have booked to come back in September - can't wait! 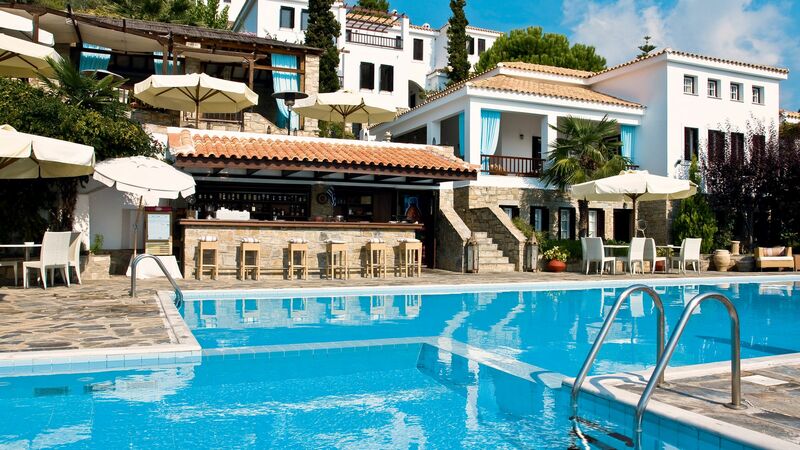 The Aegean Suites is a beautifully positioned hotel just a 15 minute walk from Skiathos Town. The accommodation is very comfortable and tastefully decorated and designed. It has a beautiful pool area with very comfortable loungers (although being so close to quite a busy main road, it can be quite noisy during the day). There is a Pool Bar that serves drinks and food during the day and a smart restaurant serving high quality food and drink in the evening. We stayed in room 108 which was about half-way up the series of stepped rooms and I would have to say that if you have a problem with steps or mobility, this would present an issue. What makes the hotel so special is the staff, Simos, Christina and Vladimir were so friendly and helpful that they made our stay just that much more memorable. They provide great service with a smile. We stayed from 20th September to 5th October so were caught up u in the 'Medicane', therefore the weather could have been better but that doesn't take away from a lovely stay in a very comfortable hotel. I will do a more detailed review very soon but just got back Oct 5th and were the last guests almost, before hotel closed for the season. Music played all day behind the pool bar (the only bar actually being used) and in the open eating area above. Totally inappropriate modern pop with a bass line which could be heard across the pool. Sometimes the pool speakers were turned on. When I asked why I was told clients asked for it. The ones I asked did not like but being English dont complain. One morning they played guitar blues for 4 hours through brekfast until I complained at lunch time. Dinner music could be the same. No Greek music ever! No dinner jazz, salsa, mellow guitar or piano, no one we recognised and we like Will Young, Ed Sheeran, Elton John, salsa, Scissor Sisters ( adults only! ) . The restaurants in town that we went in all played a good mix of styles. They also seemed to use Spotify or similar playlists via computers to change the music. The hotel seemed to have the same songs possibly on cds. Traffic noise is not restful and the road is only yards away down a steep slope. Much traffic is mopeds and quad bikes driven at way over the speed limit at about 50 plus with taxis doing at least 60 at times but gratefully they Mercedes so fairly quiet! The only eating area has no front screens, unlike most of the town restaurants so if rainy or windy there is no escape. Patio heaters are not enough especially when only one works. Surely this class of hotel can afford pull down screens. These would have been very useful during the awful weather we had during our 2 weeks, sitting under a cyclone with rain for 36 hours non stop and 40mph winds. The hotel had no back up plan and people had to eat in warm clothes and whatever waterproof s they may have had. Not good at 30/40 euros pp. The weather was once in a lifetime but thats when management steps up. Noone could leave the hotel so where was the call to each room to come down to the reception/lounge, open up the small bar ( never used when we were there ) and do a half price drinks predinner and get some party spirit? The weather was ignored by management in that respect. All in all this was not the quiet, no noise sit round the pool we thought we were paying for, ( ignoring the weather, not their fault). So beware if booking and expecting something else. Happy to answer questions. We are both 73 but still like to keep up to date. We even use Facebook, and the interwebby thing, have a good sense of humour but like good value for money and this missed the mark. Rooms are huge and comfy but tv in the bedroom, not in the louge area!! Only gets BBC News any way unles you speak Greek or German.